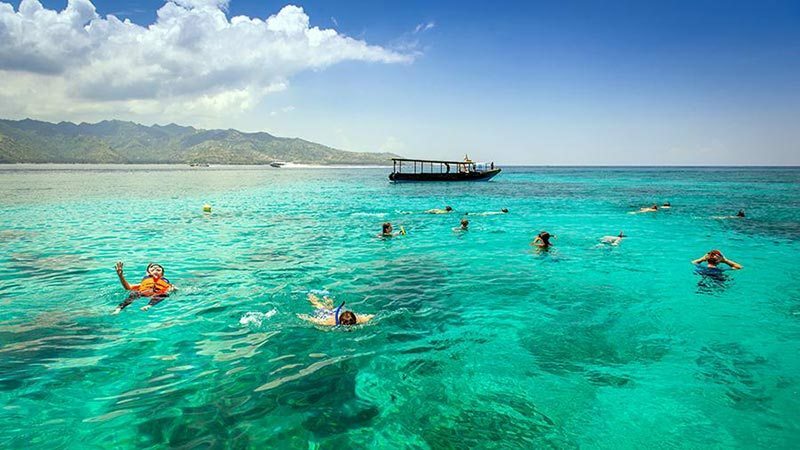 The three Gili islands of Gili Trawangan, Gili Air and Gili Meno are part of Lombok, and located only a short trip away from Bali. There are no cars or motorbikes, which makes them the perfect getaway from the busy life of Bali. 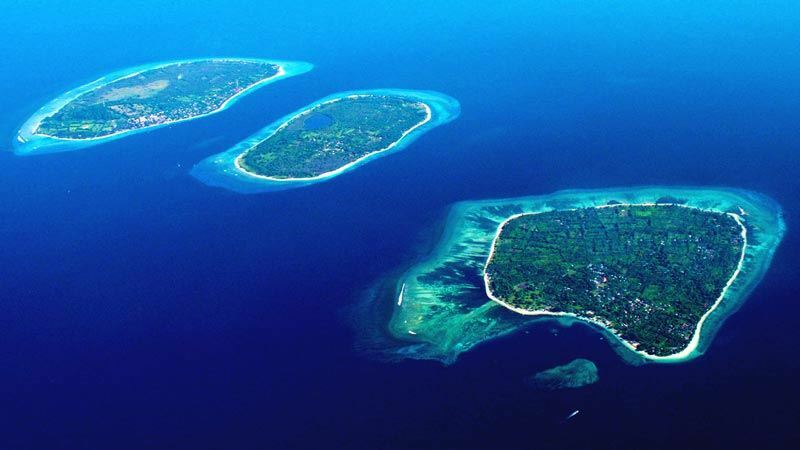 Gili Trawangan is the biggest and busiest of the three islands, known by many as the party island. 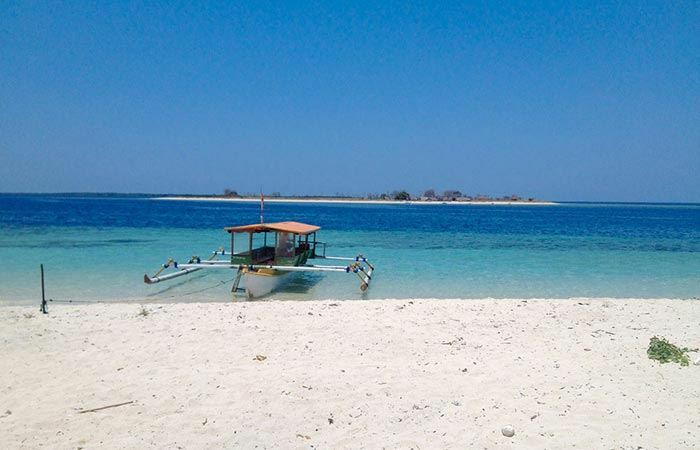 The smallest of the islands, Gili Meno, is really quiet, and thus perfect for couples and families. Gili Air is something in between; there is a small party scene but you can as well just enjoy the calm and serene atmosphere. Here is my guide on how to get from Bali to Gili Islands and further. The easiest way to get from Bali to Gili islands is definitely by fast boat. Sometimes other options might be more suitable though. It all depends on your plans or the amount of money you are willing to spend. Travelling from Bali to Gilis by fast boat takes between 1h 15mins to 2h 30mins depending on which harbour you leave from and which route the boat takes. 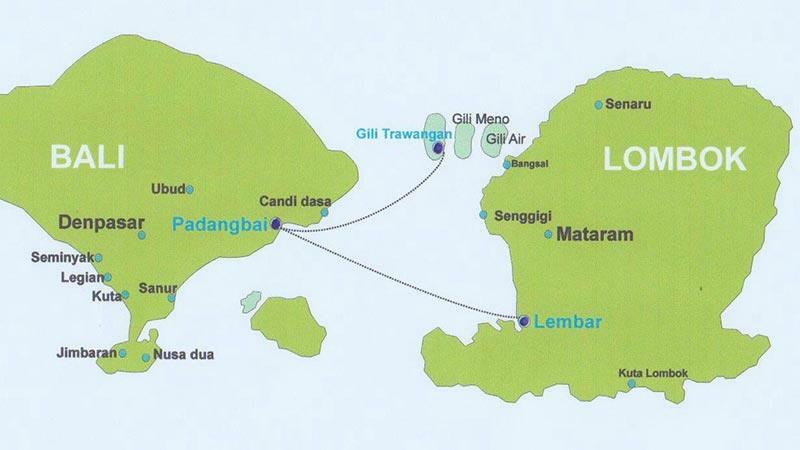 Most boats go directly to Gilis, but some stop first at Lombok or even go via Nusa Lembongan. The weather also plays a big part in the duration of the journey. Lombok strait has a really deep seabed so the waves can get really high and dangerous from time to time. I definitely recommend choosing the morning boat to Gilis and the earliest one back on your return to Bali, as towards the afternoon seas can get rough, and on a few occasions the huge waves have smashed the boat windows. Most people choose to depart from Padang Bai harbour, located in the southeast of Bali. It usually is the cheapest option and also because the time spent onboard is quite short (approximately 1,5 hours). Travelling to Padang Bai by minivan does take a while though whereas if you choose to depart from Serangan/Sanur harbour, the drive to harbour is shorter but the time spent onboard is longer (2 hours unless the company takes a detour via Nusa Lembongan which takes 30 mins more). 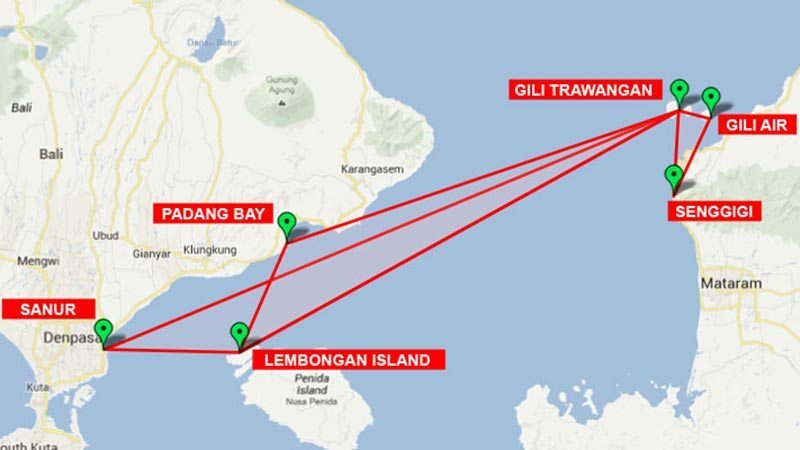 In case you are staying in Amed, Tulamben, Candidasa (Karangasem regency) or Lovina (North Bali), I would advise using the fast boat services departing from Amed. 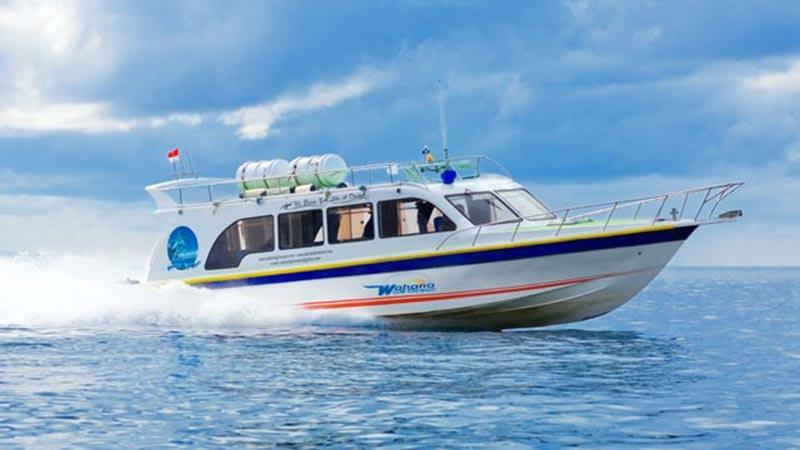 There are currently around 16 companies operating fast boat trips from Bali to the Gilis. Most of them depart from Padang Bai, but some companies also use Sanur and Serangan harbours and three companies operate from Amed on the east coast of Bali. Most of the boats depart in the morning between 8am and 10am but some companies also offer late departures around 1pm (during peak season there are more late departures). Listed prices vary from Rp.450 000 to 690 000 for one way trip and between Rp.800 000-1.380 000 for return tickets. Never ever pay the listed price. You can always bargain with the tourist agents on the streets or book via a website. The actual price can go as low as Rp.350 000 for a one way trip and Rp.550 000 for return. Extra charges of Rp. 50 000-100 000 for pick-up from further away like Jimbaran, Nusa Dua or Canggu areas may apply. Make sure that the ticket price includes pick-up from your accommodation in Bali and drop-off on your return. Before booking also ask for the name of the operating fast boat company and check their website to see if they are fully licensed, have fully accredited captains, english speaking crew, meet western safety standards and have passenger insurance. When buying the tickets I recommend to always buy a return ticket. The price will be a lot cheaper compared to buying a one way ticket each way, and you can always choose to have an open return date. When you are ready to return, just stop by at the island office and confirm your return date one day in advance. During peak season and public holidays it is advised you confirm the date two days in advance. Return on the same day is possible, but you might be asked for some extra payment. With most companies you can travel to for example Gili Trawangan but return from Lombok. That way you get to experience more places during the same trip. If you are already staying in Padang Bai you can sometimes get really good bargain prices for last minute tickets. Otherwise it is not worth going all the way to Padang Bai on your own if you’re trying to save on the ticket prices, as taxis from the touristy areas of Bali cost hundreds of thousands of rupiahs. I would recommend using the ferry only if you are travelling by motorbike and wish to spend some time exploring Lombok as well. If you choose to use the ferry with a bike please remember to bring with you your international driver’s license and the ORIGINAL registration of your bike. Just ask to borrow it from the rental provider for the duration of your trip. 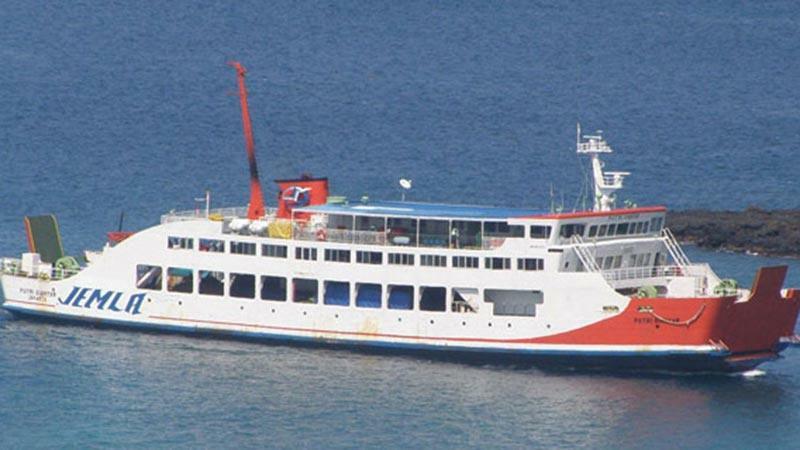 Ferries cross from Padang Bai harbour to Lembar harbour in Lombok every hour 24 hours a day. In reality this means whenever there are enough people onboard which in quiet times might take up to 3 hours. The ferry is subject to weather conditions in the same way as the fast boats ie. if the sea is really rough the ferry doesn’t travel. The travel takes approximately 4-5 hours depending on the weather and unloading of the ferry. Sometimes you also have to wait outside the harbour for the previous ferry to leave before your ferry can dock (in Lombok there are more docking slots whereas in Bali there’s only one). The price one way is Rp.40 000 per person or Rp.112 000 for a motorbike (including 2 people). Tickets should always be bought at the ticketing windows at the harbour, there’s no pre-booking option or reliable agents. It’s usually quite crowded and hot inside the cabin area but you can rent an air-com room for Rp.50 000. You can also stay on the deck; many boats have sun chairs or you can find a shady spot. Taking the night ferry is a good option if you want to save money on accommodation and don’t mind making your journey in the dark. Unless you’re travelling by motorbike, from Lembar harbour you need to take a taxi or shuttle bus to Bangsal harbour or a bemo (local small bus) to Pemenang after which you can walk to Bangsal. From there you can buy a ticket for public slow boat to get to the Gilis. Prices are approximately Rp.15 000-20 000 depending on which island you want to go to. The public boats only run until 4pm and the trip takes around 15-45 minutes. There are also public speedboats travelling the short route, the price is about double compared to the slow ones. Alternatively you can travel to Teluk Nara harbour and charter a local outrigger boat from there. The price depends on your bargaining skills. 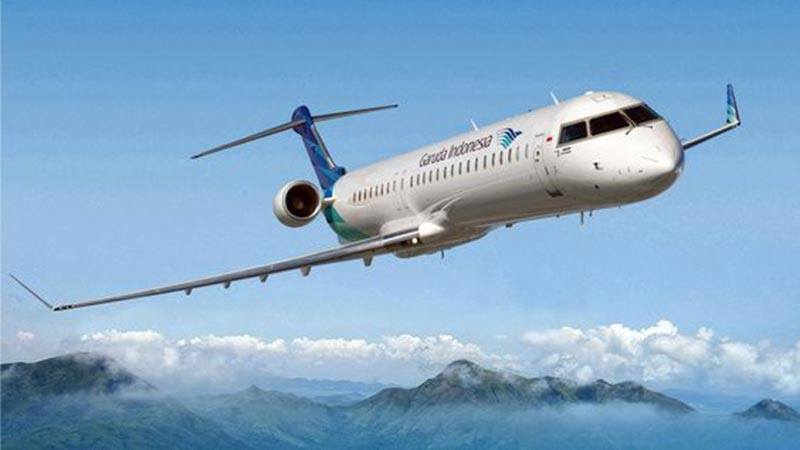 Garuda Indonesia, Lion Air and Wings Air fly from Denpasar airport to Lombok Praya airport. The flight time is around 30 minutes and the price one way starts at less than Rp. 200 000. From the airport you need a taxi or a hired car to Bangsal harbour to catch the boat to Gilis. 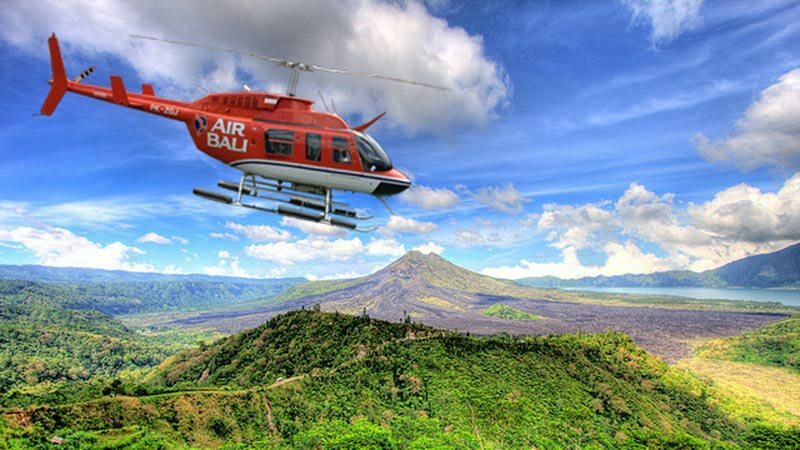 Air Bali offers helicopter transfers from Benoa harbour in Bali to Gili Trawangan 6 days a week. They have 20 years of flying experience, western pilots and engineers and a 100% safety record. The time onboard is approximately 45 minutes but the whole duration of the trip is 90 minutes because of mobilization. The price of one-way transfer for max.5 people and luggage (with combined maximum weight of 437 kg) is USD 3 300. Sometimes they offer promotional packages on their Facebook page so check that out as well. The Gilis have a wide range of accommodation on offer ranging from cheap backpacker homestays to mid-range hotels, luxury resorts and boutique villas. 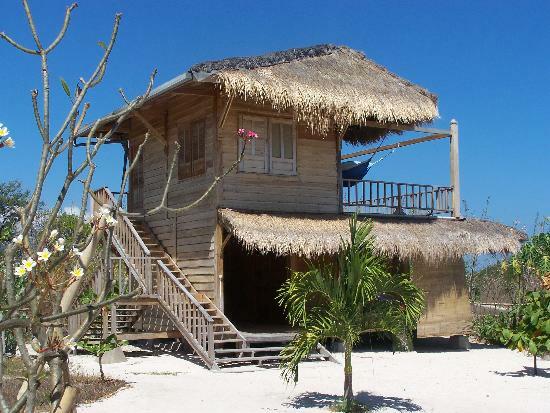 On Gili Trawangan the backpacker fan rooms start from Rp.150 000 per night and mediocre AC bungalows from Rp.350 000. There are always hawkers offering accommodation options on the fast boats and at the harbour in Gilis. If you have something special in mind, I would recommend booking your accommodation in advance. Agoda has some good bargains, but you could as well go look around once you reach the island. In Gili Trawangan it doesn’t matter so much where you stay, even from the inland village it only takes around 7 mins to walk to the beach. In Gili Air and Meno I would recommend staying in a beach bungalow to truly enjoy the island experience. From Gili Trawangan you can either charter a fishing boat from the beach (this is a good option if you have a big group and good bargaining skills) or catch the infrequently scheduled Koperasi island hopping boat (departures are usually in the morning and afternoon) to take you across. Tickets can be bought from the ticketing office where the boat departs, there’s no need to pre-book. Prices are really cheap, around Rp.30-40 000 for one way trip. Even though the distances are short, don’t try swimming from one island to another. The currents are really strong and people have failed trying this. If you want to go to Lombok, public ferries (outrigger boats) depart infrequently between 8am and 4pm from the harbour. You might have to wait a while because the boats only leave when full. Tickets can be bought on the same day from the ticketing office where the boat leaves. The price is on average Rp.25 000 one way and the trip takes approximately 30 minutes. A public speedboat is a bit faster, leaves on schedule and will set you back around Rp.80 000.